The Intensive Care overbuild at the Pittsburgh Veterans Affairs Medical Center received top honors from the Master Builders Association of Western Pennsylvania. 'It was a unique design-build to put a fifth floor on a three-story building. We had to hang the fourth floor from the fifth floor's steel structure!' - Rocky Bleier, owner, RBVet Co. Array Architects teamed with Pittsburgh-based, Service-Disabled Veteran-Owned Small Business RB Vet Co. for this Design/Build healthcare project in Pittsburgh. The purpose of this project was to design and construct an addition to the fifth floor level of the Clinical Addition Building consisting of ICU rooms and associated support areas at the University Drive campus. After a thorough review of the Health Care Guidelines for ICU (CCU) and all applicable VA design specifications, the design team determined the floor plan area originally suggested did not address all of the requisite design criteria. Array developed a floor plan that accommodated each of the required items. 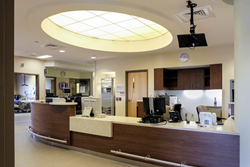 The expanded floor plan incorporated each design element necessary to ensure the completed ICU is an operationally efficient, staff and family friendly state-of-the art unit. The challenge of the overbuild required the project team to work with the existing reinforced structure. Steel columns and beams extended to form the two-story addition, while several overhangs beyond the existing footprint accommodate the floor plan. The solution was then clad in metal panels to give a contemporary appearance. The Master Builders Association of Western Pennsylvania engaged a team of industry experts to judge the submittals. Tom Kennedy noted about the ICU endeavor:“The Veterans Administration Medical Center Modernization of ICU Beds project at the VA Hospital in Oakland was a truly collaborative Owner, Contractor, Architect effort. The Design/Build team assembled by RBVetCo, LLC creatively solved difficult design and construction challenges. The structural limitations of the existing roof led to the creation of an interstitial floor below the new ICU unit, where the mechanical equipment is located and is suspended from the new structure above. The design also accommodated the potential for both vertical and horizontal future expansion, while utilities and venting that penetrated the existing roof had to be rerouted. The site was constrained both by its location and by a concurrent project adjacent to the hospital that shared the same access and staging areas. Construction was completed while normal hospital operations continued below." "It's all about the people that you get and the relationships that you have and how you work together," stated Rocky Bleier, owner of RBVet Co. I want to give them the credit - the engineering and design team - looking at problems and deciding how best to solve the problems." The team accomplished the projects within budget and schedule to provide the Veterans Affairs Medical Center with nine additional intensive care beds where they can treat veteran patients. Array is recognized as a leader in healthcare facility planning and design, offering a full complement of knowledge-based services including planning, architecture, interior design and asset advisory from our eight office locations. Our design process uses Lean as a foundation for a unique Process-Led approach that better meets the needs of today’s healthcare organizations. Array's devotion to a healthcare-exclusive practice springs from our belief in the power of design to improve patient outcomes, maximize operational efficiencies, increase staff satisfaction and provide remarkable results for our clients.